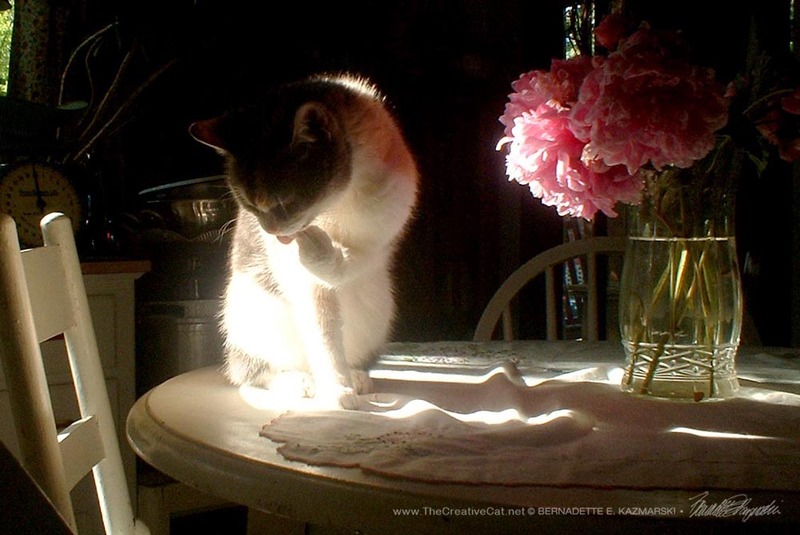 While Peaches appears in dozens of sketches and hundreds of photos, this is the painting that captures her, pretty, petite, unassuming, a creature of feline habit in her adopted home after she’d spent a lifetime with someone else, perfectly relaxed and assured that she belonged on the table having a bath in the sun. Although I photographed this scene because it was a pretty picture I also knew it would be a lovely painting. I don’t devote the 30 to 40 hours and limitless patience it takes to create a painting at this size and level of detail unless I’m committed to the subject. Just the peonies on the table with the wrinkled cloth would have been a striking still life, but that alone would not have inspired me to work this hard for a painting. I photographed this scene in June 2006 and the depth of inspiration I felt in that moment traveled with me for nearly two years to March 2008 when I finally decided I had to paint the scene. And the love I felt for sweet little Peaches that came welling up when I recently reviewed the photos of her just being herself that I’d taken that evening was also an essential part of working very hard for a painting to be successful. Though some are blurry, you can see how she loves the moment on the table and being my model, she looks right at me, tilts her head, and I’m taken right back in time. I made a video of those photos, used in the order I took them so you could see the light change and the scene develop. You can enjoy it below or see it on YouTube. I’ve repeatedly referenced this painting, and that’s because it’s very meaningful to me. “Peaches and Peonies” hangs above my worktable in my studio; each time I walk into the room I look at this painting, and as I work in here I find myself studying some small detail of it, and each time I do, I remember Peaches. For me, that’s what art is about, the work itself, and what it gives to us each time it touches our lives, whether that’s a memory, a new insight, or a reassurance for something we believe. My worktable watched over by Peaches. It was on June 5, 2006 that I took the reference photos for this painting when the angle of the sun moved into the right position. A friend had given me a bouquet of pink peonies from her yard and I put them in a vase in the center of the table on the embroidered cloth. Peaches liked to have a bath in the sun. It all came together on its own. The photo below below was the one I published on my website at the time (no blog yet), and the one I chose as the position I liked best. My main reference photo for “Peaches and Peonies”. Note all the “stuff” in the background…this is why we have art. I can choose to keep or remove things, or add things that are appropriate as I see fit. I determine pretty quickly what inspires me enough about a scene to paint it, and I keep all that supports that inspiration and remove what distracts from it. Photographing this scene and deciding to paint it caused me to do a deep and careful study of two periods in art in order to support my own insights. First, the Dutch Masters, specifically Rembrandt with that one beam of light illuminating the focal area of the scene which I had noticed far back before I even studied artwork, and Vermeer in all the minute details. Second I studied a variety of Victorian still lifes with their rich colors, dramatic interior lighting and ideal of abundance and comfort; I’d grown up seeing these around the house as what I called “cardboard paintings”, really cheap reproductions printed on textured cardboard with a plastic frame, but even this can provide inspiration for young eyes looking for ways to visually interpret the world around us. I considered keeping the vegetable scale and the window with possibly a different curtain, but when I lightly worked it into the first draft I felt it was distracting and decided on the background in various shades of purple and violet with just a slight shading in the upper left indicating the light source and isolate the dark area on Peaches’s head from the background. There it is, that moment that turns on all the lights for me…one of my cats in the sun, the conditions that have inspired most of my portraits. Cats are creatures of habit, and Peaches chose this spot to have her after-dinner bath every day for a few weeks when the sun was right; I knew it was a keeper whether a photo or a painting, so I photographed it, knowing I’d use at least one photo or all the photos as reference to create one painted image. A painting this size and level of details is a significant investment of time, so I had to wait until my schedule allowed the night-after-night sessions with tiny sections of detail. It’s one of those paintings I still look at and can’t believe I painted; Peaches and Peonies hangs in my studio watching over my work and providing constant inspiration. Detail of embroidered cloth and chair. 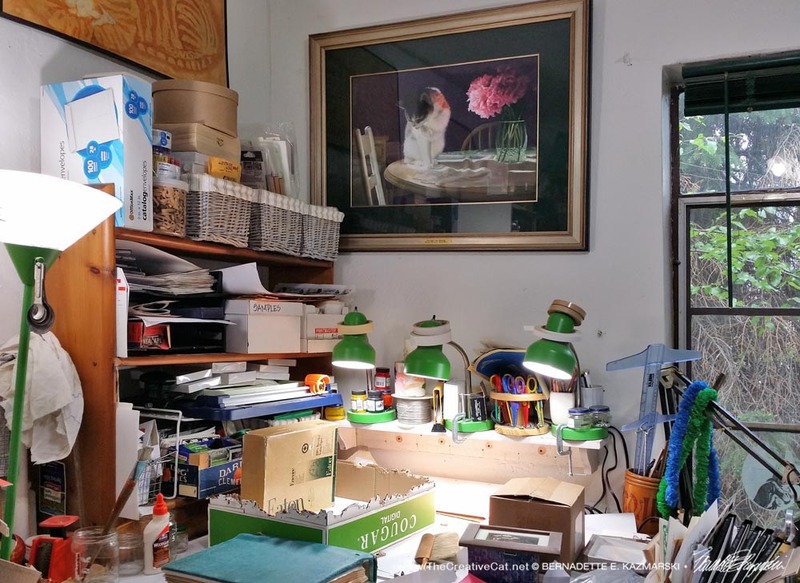 Soft pastel is generally known for more Impressionist applications, not classically detailed portraiture or still life, and that had always been my experience with it as well. In those late-night sessions after work years ago when I was reaching for my voice as an artist and working in pencil I desperately wanted to “paint”, apply color to a surface and mix and blend and create the lovely images I was visualizing, but with the irregular times I had to work setting up, cleaning up and working on a canvas in oil or acrylic just didn’t work. I found that box of cheap pastels I’d picked up somewhere, and even added colored chalk to fill in for colors that weren’t in the box and found that no matter where I stopped a painting, it was always there for me when I got back, no drying or shrinking or anything. In time and with lots of experimentation I developed the highly realistic style I use today for my commissioned portraits, landscapes and even illustrations. “Peaches and Peonies” came along 20 years after that learning curve, and with the experience of those two decades I could visualize not only the scene in pastel but the actual pastels I’d use in all my boxes of them, the way I’d apply them and blend them, the pastel pencils and harder pastels I should have on hand, working out possible difficulties and planning which colors I’d need to purchase to be sure I had the right hues, and enough of the major colors for maximum coverage. I have three shades of violet and purple in that background, all blended together with just a bit of creamy light coming in at the upper corner. There was a lot of purple in the air, on the floor, and on my kitties as well—good thing it’s non-toxic, and I always keep a little hand-held vacuum handy for when I really make a mess. It all begins with a rough, blocked-in underpainting of areas of color, and these colors may or may not be the final colors you see; often they are a layer of a complimentary color that brightens the color on top. Most media aren’t entirely opaque, even paint, and our eyes are more sensitive than we give them credit in being able to sense layers of color and blend them to one final perceived color. Shadows can be still and “dead” as I call them, and dark colors can recede in our perception. That background stood a good chance of being one of those “dead” areas, but I had decided I didn’t want to introduce any other objects or even lighter tones, I wanted that big dark background to contrast with the light. I chose purple for its relation to the palette in the painting and its ability to be vibrant though dark, though even that can be dense and still. To liven it up I begin with a color complement underneath, in this case shades of yellow, which make the purple more vibrant, and this was also the reason for the variety of shades of violet and purple, warm red violet and cool grape both layered and blended but still dark. Our eyes can perceive this as giving the area dimension instead of being just flat, though at first glance it looks like just a big dark purple background, if we notice it at all. Lighter areas also get a complementary color treatment underneath, usually in a darker color so that I can build the highlights out from the shadows. Peaches’ fur is creamy white and is even warmer in the sunlight, so she has lots of tones of blue and green underneath to give her fur its sense of depth and softness and the richness of its color. Each of her highlighted furs is a single or blended tone of warm yellow in contrast with the cooler background on which it’s drawn. And her right side, reflecting back the light reflected from the peonies and the vase, is so full of color it was hard to know where to start. Though the overall scene itself was an inspiration, as I’d mentioned above, I would not have devoted this time and effort without the presence of Peaches. A cat bath is a complicated thing and one of my favorite things to watch, so methodical and energetic. One of the most difficult decisions was which bath position I liked best and thought captured Peaches at her best; you can see from the video above that I had many choices. Cat baths are energetic, whether they are tiny kittens or old ladies like Peaches, a constant and systematic process that in minutes cleans the entire body, and describes one of the things I like best about cats, their inherent practical nature and ability to focus on their task, whether it’s bathing or playing or settling in for a long nap. The sitting position captures the energy of the bath better than any other along with showing off features and details of the cat’s body with out the physical distortions of other postures, and it was important to include enough of Peaches’ face to recognize her—a difficult task considering she’s using her face to bathe. This was to be a portrait of Peaches as well as a nice painting and I wanted to be able to see as many of Peaches features as clearly as possible. I knew I wanted her washing her face because in any other bath position the face is too obscured or distorted, and just because I loved to watch Peaches wash her face. Did I want a paw swipe across the nose, or a cleaning behind the ear with her head tilted and her ear folded, or a paw lick? In the end I chose the paw lick because I could see the most of her face, and the lighting on her paw and leg were so beautifully interesting. I’ve also loved a few other details of the bath session with cats, one being that with all that energy flying around with one paw and swiveling and swinging to reach every spot possible, they tend to cling as much as possible with their claws on their hind paws, extending them even if they have nothing to grip, and you can see all the wonderful details of their structure. Most of the objects in this painting are actually white—the cloth on the table, the table and chairs, the cabinet—and Peaches, for the most part, yet it was the beauty and richness of all the reflections from the peonies and from the golden late-afternoon sunlight reflected off all that white that makes the scene what it is. I planned out the details of Peaches’ fur as silhouetted against a dark background with nearly every hair lit by direct or reflected light. You could see all the little guard hairs and this was integral to the overall effect of a sunlit Peaches. In addition, she has her basic fur colors of peach and gray and creamy white, but they are each influenced by the type of light that shines on or reflects on them, especially that spot on her upper shoulder that is actually peach, but the peonies reflecting on her make it look quite pink! But some of the other details left me dumbfounded. I had no experience with many of these objects like glass and an embroidered cloth and illuminated peonies. But that’s the fun of painting in a new style, and a new subject. Those peonies reflected on everything giving the entire scene a warm pink tone hence the purple background, and I wanted to work their complicated structure of petals from their most brilliant highlights to fade into the darkness as well as the light shining through the petals as I’d seen in countless classic still lifes. There are some colors that can’t really be reproduced in reflective media like pastels and paint and even photography, and the shade of pink where the sun shines fully on the peonies is one of those because there are so many colors in sunlight, one single flat tone, even blended, can’t really capture the depth and brilliance, but we can come close and hint at it and also show the effects of the color on the rest of the scene. Like the reflections on Peaches and the overall pink tone, the reflections on the cloth are brilliant. And the detail in that embroidered eyelet cloth had me itching to get started. When it comes to paintings like this I love those sorts of everyday details, choosing an area to work all at one time, sometimes as small as one square inch, to be certain I stayed consistent in color and style. Way back when I painted “Waiting for Mom” I had painted the braided rug completely flat with no wrinkles, but another artist friend advised me to include that buckle in the rug because it added interest, so in household items like the cloth I’ve capturing wrinkles and the areas around the eyelets that are puckered. I not only want you to reach out and pet Peaches, I want you to reach out and straighten out that cloth. However, the cloth itself has so many colors on it and in it, including the pink from the peonies as well as the bright palest yellow of the sunlight, and also simply warmer tones in shaded areas where it’s facing the sun and cooler tones in the shadows where it’s facing away. And then the embroidery, the openwork, the wrinkles, it was really something to analyze and just get a start. Detail of cloth and table. But even with decades of skill and experience there are always things we don’t know, and times we just have to move beyond our logical reality and trust our senses and intuition; this is one of the greatest lessons the practice of art has taught me. In prior paintings I had encountered cats, of course, as well as tablecloths and painted furniture and flowers, but I had never painted glass or transparent objects as in the vase with water at this level of detail. I knew the vase would be a challenge and savored working out the methods for representing only what our eyes perceive about an object that is transparent. So I set about the process of painting glass, or water inside glass, or stems inside water inside glass. I remember looking at my tiny—in comparison—reference photo and looking back and forth between that and my rough first layer of pastel, holding a pale “green earth” pastel in the air and my mouth hanging open a bit, back and forth, uh…um…where do I start? And where do I go from there? Sometimes I give myself a challenge by drawing something in reverse of what I’m familiar with, a reflection in a mirror, or simply drawing a mirror image of something I’m looking at. For all my flexibility of visualization and constant practice in drawing, I’ll just say this really blows my mind—I find it very difficult, and it gives me a headache because I am trying to constantly draw what I know and not what I see. And this was the way I felt at first approaching the vase in this painting—I knew what it “should” look like, but what I was producing did not look like water-filled molded glass. I just had to let go and draw what I saw, trusting it would all come together in the end. And so it did. So there we are with the inspiration-to-painting genesis of Peaches and Peonies. As I mentioned above, I still look at certain small areas and wonder how I figured it out. You can read more about Peaches, who arrived here with her sister in June 2005 after their owner had died and all other possibilities for them had been exhausted. They were called Angel and Rosebud then, but I renamed them Peaches and Cream, and though we lost Creamy just a few months later Peaches lived to be 20, and never looked back. I much prefer to ship prints flat. It may be a little more expensive than a mailing tube but it’s worth it not to have to coax the print to flatten out for framing. However, I can ship prints rolled in a mailing tube on request. Visit this art to see the details of shipping for all the prints. The framing I have on the original painting. Framing is often more expensive than the art itself. Custom framing is available for an estimate; I custom frame all my own things. To save a little bit on framing, I chose 13″ x 9″ for the the smaller print so that it would fit into a pre-made 16″ x 20″ frame that comes with an 11″ x 14″ mat leaving white space around the print, which is typical in framing a high-quality print. The larger will fit into a pre-made 24″ x 30″ frame, though you may need to purchase a mat since most larger frames don’t come with a mat. If you’d like to request something special or donate through the Senior Pet Adoption Donation program you can email me or comment when you order. I firmly believe that looking at beautiful images fills our hearts with a special sort of peace, and also promotes love for the subject of the image, and so I always hope with every image I share that I am helping to promote a peaceful world in even a tiny way and a love of cats in all their beautiful shapes and colors and ways of being. Thank you, Annie. Only Peaches would have inspired a painting like that. Such gifts my cats bring me. Just gorgeous! I enjoyed the video of the light play very much.